Premier Sports Memorabilia - Vintage-style, Wooden, Hand-operated Scoreboards – Hands-on Fun For The Passionate Sports Fan! Feel free to contact Scoreboard Classics any time! Say "hello" - we'd love to hear from you! If you’re the quintessential baseball fan, you’ve probably always loved the old-school ballparks, with their unique dimensions, idiosyncrasies, and of course, manually-operated scoreboards (with a crew inside hanging numbered, tin panels onto screws from panes). There’s always been a certain mystique as to what goes on inside these remnants of baseball’s past. 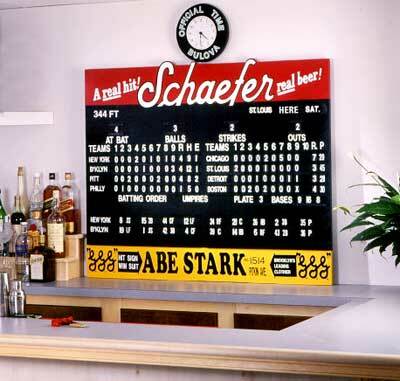 Many a fan has wished that for just one day he or she could run one of the vintage, historical, old-time scoreboards monitoring the action at such ballparks as Wrigley Field, Fenway Park, Ebbets Field and original Yankee Stadium. Well, now you can! Red Sox gift for the passionate Red Sox fan! Looking for the ultimate gift for the passionate sports fan in your life? One they’ll never forget? Maybe you’d like to treat yourself to an innovative, unique, exciting sports collectible with timeless appeal. You’ve come to the right place! Most sports memorabilia isn’t dynamic. T-shirts, hats, posters, autographs, jerseys – they’re all an important part of any serious fan’s collection, but they just don’t have anything to do with what’s actually happening on the field. Ever walk into a friend’s house a few innings into the game? If you’re a typical fan, what’s the first thing you say? “What’s the score?” “What inning is it?” “Who’s pitching?” This is what diehard sports fans live for! It may not be possible to make it to every game, but when you own a Scoreboard Classics™, it’s the next best thing to being there! You’ll stay on top of all the action! Post scores of out of town games. Celebrate your team’s latest triumph with friends. Be an active participant in the drama that unfolds all season. In baseball, from spring training – when hope springs eternal, through the dog days of summer, to the brisk autumn air of postseason baseball. Join your team through all the ups and downs of a pennant/play-off race that mirrors life itself! Don’t just watch the game. Live the game. 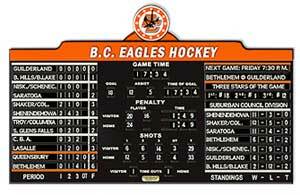 Your own hands-on, authentic Scoreboard Classics™ will keep you part of the action season after season! 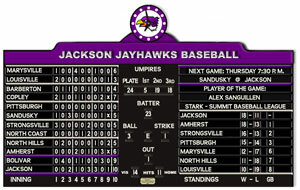 A Scoreboard Classics™ never goes out of style!